Psycho Donuts is not taking sides (Chick-fil-A). Psycho Donuts has what they call their Psycho Moral System or for short – PMS. They want ALL donut loving Americans to eat what and wherever they wish. Today Psycho Donuts has baked up a new choice: The Gay Bar – Read All About It! When: Starting today, August 1st. Where: Psycho Donuts Campbell – 2006 Winchester Blvd. or Psycho Donuts San Jose – 288 S. 2nd Street. Call (408) 533-1023 for hours etc. None the less, I wish that my now adult children were still kids. We would be spending an afternoon at the Pruneyard. FREE with same day “Cars 2” ticket purchase: Face painting, balloon artists, carnival games and prizes, snowcones, contests, arts and crafts table courtesy of Home Depot, PLUS giveaways while supplies last! Last night, Mauricio and I went to check out Incendies at the Aquarius in Palo Alto. We stopped by Pampas first to grab a few drinks and a snack. I got the Gaucho which was Ypióca Crystal Cachaça, Canton Ginger Liqueur, Mango, and Lime. It was pretty refreshing. It got me wondering what Ypióca Crystal Cachaça was and so I looked it up when I got home. It’s spirit distilled from sugar cane aged for 1 year in Brazilian freijo wood barrels. Pretty interesting. It went well with the Canton ginger liquor, which I love. Mauricio got the Cosmo del Diablo. I think the drink fits him perfectly! Haha…inside joke from a Words with Friends game. The drink was 42 Below Vodka Infused with 3 Chiles, Pineapple, and Passion Fruit. If you like drinks with a bit of a bite or a kick to it, you’ll like this drink. In fact, I think I liked his drink a bit more. We also shared the ceviche, which was pretty light and refreshing. It made me think of the ceviche at Casa De Cobre since it was probably one of the best ceviche’s I’ve had in the bay area. 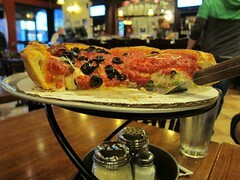 Afterwards, we grabbed some pizza at Patxi’s which is right across the street from the theatre. We did ordered a combo pizza with half half of the Favorite which came with pepperoni, mushrooms and black olives and the Special which has sausage, mushrooms and black olives. We had nearly half the pizza left, but it was because the pizza is pretty big and filling. It was really good though. They also have Hogaarden on tap, which is always a bonus in my book. A few blocks away at the Aquarius, we saw Incendies, which had won a few awards and screened at various film festivals across the world. I love these older theaters. They just have a nostalgia about them that has me a bit sad because I know after awhile, the big commercial movie theaters will eat them all up until there are none. Anyways, the film was rather heavy and serious so I almost feel awkward for wedging it in a post about pizza and a dive bar. The film is about two twins whose mother’s death leads them to start to unravel bits and pieces of her life that let them to travel to parts of Lebanon and Palestine. The imagery and method of story telling was beautiful and while I found a bit of the overall plot to be somewhat over the top with the twists and turns and even contrite and predictable, I still enjoyed it. I really don’t know why any mother would subject their children to learn what the two twins in this film learned, but I guess it made for a sad story to tell. The film despite being a film of a series of sad and unfortunate events wasn’t with out uplifting moments. While I felt it could have been developed a bit more, the strength of Nawal Marwan (the mom) character through all of her adversities was courageous. The conviction and love that she had for her husband and three children was very admirable. It was also interesting to see the impact of the Muslim-Christian strife in the middle east. We take a lot for granted here in the United States. We live a very peaceful life here compared to so many other countries which are plagued with political conflict and wars. Another side note about the film. They used a lot of Radiohead in the sountrack, which I felt was really fitting. After such a heavy film, we tried to find something open that late on a Monday night. We checked out The Wine Room in Palo Alto where we had a glass of wine and ended up talking for a bit. Pretty cozy place to sit and talk. There was a couple nestled in one of the corner couches, hope we didn’t kill their romantic time by kicking it in the back there with them. Looking for something else to do after the Wine Bar, we headed back to Campbell and ended up at the Cardiff Lounge, which was nice because I ran into an old friend there who I was able to catch up with which was rather nice. Polished off a few more drinks before heading home. I think Mauricio and I did pretty good for ourselves. Three bars, a restaurant and a movie. Not bad, for a Monday night. This Halloween weekend, October 30 & 31, journey back in time to the days of the Frontier Village amusement park. Campbell resident Shaughnessy McGehee opens his backyard for Halloween that has an old western town modeled after buildings that were at Frontier Village. Included are authentic Antique Autos, signage, photos, and other memorabilia from the old amusement park. You will see gunfighters and western re-enactors in costume. Hot dogs for the first 100 guest both evenings and of course, Trick-or-Treating for the kids. This is a free event. Stroll tree-lined Campbell Avenue from 6:00 pm to 9:00 pm the first Friday each month for late-night shopping, dinning, live entertainment, or just sit at a sidewalk cafe watching everyone else stroll the avenue. May’s First Friday features the artwork of children 12 years old and younger displayed on Downtown Campbell shop windows as part of the Children’s Art Contest. Downtown Campbell has a free Wi-Fi network. Wi-Fi Hot Spots providing outdoor coverage include Gelato Classico, Sonoma Chicken Coop, The King’s Head Pub, and Orchard Valley Coffee. In 1892, Benjamin Campbell formed the Campbell Water Company, Campbell’s first utility company, and the 130-foot water tower has become a symbol for Historic Downtown Campbell. Explore over two-dozen historical landmarks with a free walking tour map available from the Campbell Historical Museum.